C. Wilson Peck, in his history and catalogue of British coppers (p. 106), states the counterfeiting of copper halfpence began soon after Charles II started production of the first regal issue. Apparently the Board of Trade supported a suggestion that the minting of tin coins would stop the counterfeiting. Realizing this would help the tin industry and greatly increase minting profits, proposals were approved for the minting of tin halfpence and farthings. Tin coinage went into full production under James II and, as expected, minting profits dramatically increased; Mossman has calculated profits rose from 18.9% to 66.6%. However, the use of tin did nothing to stop counterfeiters. Tin was much cheaper than copper, was readily available and was more malleable thus making it easier to work. For these reasons, the number of counterfeiters dramatically increased. William and Mary minted tin coins from 1689-1692 but due to the counterfeiting problems had to abandon tin and return to copper. William's copper coins were not made by the king but rather were contracted out. The result was a lesser quality product made from cast planchets. In fact, the quality was so low and the weight range so erratic that it is now actually difficult to determine if a William III halfpenny is genuine or counterfeit. Interestingly, it does not appear any major counterfeiting operations took place at that time rather it seems counterfeit William III halfpence were produced at a later date. The first significant counterfeiting of British coppers is usually considered to have occurred during the reign of George I following the cessasion of the minting of halfpence and farthings at the end of 1724. In a treatise from mid century it was stated that between 1725 and 1730 most counterfeiters melted down regal coppers to make debased cast counterfeits. No doubt this was due to the increase in the price of copper which rose from 12d to as much as 18d per pound in 1717 (but averaged about 13d during the first quarter of the Eighteenth century). Then, according to the treatise, starting about 1730 the counterfeiters turned to the use of commercial copper; again probably due to the 1.5d reduction in the price of copper in 1729 (the price then remained stable for the remainder of the century). It has been conjectured that a large group of 362 cast counterfeit 1699 William III halfpence found in Philadelphia in 1975 were produced between 1725 and 1730. Apparently the counterfeiters made cast copies of older 1699 William III halfpence so they could be passed off as well circulated worn specimens. Over the course of the next fifteen years the number of counterfeit coppers in circulation continued to increase. To curb this annoying problem Parliament passed an act in 1742 making it a crime to counterfeit copper coins. Since coppers were considered to be token coinage and as there had been a long tradition of local token coppers, the counterfeiting of regal coppers had not been thought of as a criminal act. Even in the new law (15 George II, chapter 28) the crime was listed as only a misdemeanor punishable by a maximum of two years in jail, while the counterfeiting of silver or gold coins had long been a felony punishable by death. As the copper content in the regal halfpence and farthings was only about half of the face value of the coin, small operation counterfeiters could potentially have made a profit even if they made full weight coins. Of course, counterfeiters did not make full weight coins, rather their products were generally from 20% to 50% lighter than regal issues. Further, through the period up to the mid 1740's British counterfeiters usually made cast coins. As casting required the counterfeiter to heat metal to a molten state these individuals would increase their profits by mixing the more expensive copper with cheaper metals to produce coins that were not only lightweight but also debased. Most often lead, tin and/or zinc was used as alloys as they were more malleable than copper. Interestingly, on a few occasions, cast coins with a high lead content will actually be heavier than regal issues but will have a lower intrinsic value. For additional information on cast coppers and their two basic methods of manufacture see the section on Cast Counterfeit Coppers. However time has shewn that the punishment of two or three was not sufficient to deter others from the like practices; on the contrary, the last winter and the preceding, these counterfeit halfpence abounded more than ever, insomuch that few payments were made without a large proportion of them. the practice of making counterfeit halfpence was revived with this improvement, that whereas they were before cast in sand; they are now made in a stamp or press. The great dispatch these engines make, the number employed in this work, and the vast profits arising to the makers, and the vendors of these goods, must needs occasion a torrent of them to be thrown in upon us, without a speedy prevention. A common stamp, with two pair of hands, is capable of turning out 50 gross in a day: that several of these engines are thus employ'd is evident from the variety of impressions which have appeared among us, all distinguishable from one another, and from the genuine halfpence, to which the counterparts are very much inferior. The author went on to estimate the counterfeiter's profits. He estimated the base metal used by the counterfeiters cost about eight pence per pound and would yield about three shillings in coins (that is, 72 per pound or about 97.2 grains per halfpenny while regal issues were minted at 46 to the pound or 152.2 grains per halfpenny). This would give a profit of 28 pence per pound but, as the author stated, the counterfeit halfpence would, "pass thro' several hands, before they reach their intended value." Usually a counterfeiter would sell a quantity of coins to a wholesaler for about half their face value. The wholesalers would take the coppers throughout the country and sell them at about two-thirds face value to interested parties such as merchants, small companies and individuals called smashers. These people would then pass the coins off in commerce at face value; merchants would hand them out as change, companies would use them to pay employees their wages and smashers would simply make purchases with the counterfeits. It seems, according to the letter mentioned above, mass produced stamped counterfeit halfpence started appearing in the spring of 1751. Soon thereafter, on July 12, 1751 the king issued a royal proclamation that the 1742 anti counterfeiting act should be enforced. Apparently many officials had not considered the apprehension of misdemeanor halfpence counterfeiters to be a top priority. However, with several counterfeit presses in operation, by February of 1753 it was estimated almost half the coppers in circulation were counterfeit. At the same time significant quantities of counterfeits were being sent to the colonies. Even with enforcement of the law the counterfeiters could not be stopped. The potential for large profits far outweighed the punishment should one be caught and convicted. In Birmingham even some of the larger industrial complexes produced counterfeit coppers, along with making various metal products and numismatic token. Smaller operations probably consisted of a small group of investors who acquired a press and hired (or took on as a partner) a skilled workman such as a metallurgist, gunsmith or silversmith to create a set of engraved dies. Possibly with the assistance of a few laborers to work the press, they supplemented their regular income with the production of counterfeit coppers. Some of these smaller operations refined their own debased metal making the coins as impure and as lightweight as possible. Others simply bought quantities of blank lightweight disks from the copper factories, as the disks were openly sold under the pretense of being buttons and harness decorations. They would simply heat up the pre-made disks and strike them into coins. The situation deteriorated even further in the following decades, with counterfeit halfpence being produced in both England and Ireland. Partly because of the counterfeiting problem no coppers were produced during the first twenty years of the reign of George III. When production started up again in 1770 the counterfeiters outdid themselves, far surpassing the production of the royal mint. As the principle concern of the counterfeiters was perpetrating a deception, we have no way of determining the actual number of counterfeits made in a particular year. Counterfeiters often made their coins look quite worn, some would not add a date or only put a partial date on the die. Also, they often used earlier dates to avoid detection, such as making 1771 dated halfpence in 1778, or making halfpence with dates and the image of the previous king George II. Realizing the inability to precisely date the year of issue of counterfeits, it is nevertheless interesting to observe in D.T. Batty's 1886 catalogue listing all of the varieties of halfpence he could find bearing the dates 1770-1775, there are 567 different varieties, of which 52 varieties were genuine issues and 515 were counterfeit issues. Within a year of the renewal of regal halfpence production it was clear the situation was out of control. Therefore in 1771 a new law was passed making counterfeiting a felony and placing penalties on distributors as well as minters. However, this did not stop the lucrative counterfeiting trade. Counterfeits continued to be produced and distributed. Now that there were severe penalties at home, several individuals started producing evasion coppers in large numbers for internal distribution, as these were not covered by the counterfeiting laws, and sending their counterfeit issue abroad. Undoubtedly throughout the colonial period some counterfeit halfpence were inadvertently brought to the colonies from Britain in shipments of coppers. However, there were also intentional surreptitious shipments of counterfeit coppers. What is usually considered to be the earliest surviving group of counterfeit British halfpence in the American colonies comes from the 1975 Philadelphia highway find. A significant hoard of 362 cast counterfeit William III halfpence were discovered in Philadelphia during the construction of Interstate 95. All the specimens were type two halfpence dated 1699, with the date following the legend. Of the group 187 examples were examined and found to have an average weight of 111.6 grains but with a wide range from a low of 67.6 grains to a high of 169.4 grains. The edges of the coins had been filed to get rid of the excess metal that overflowed in the molds. Newman noticed the surfaces of the coins were rough and pitted, as they would be when they were first made, indicating they had not been smoothed by circulation. For this reason it is suspected the coins were buried before they were put into use. Further, Newman conjectured the copper used to make these coins was from melted regal coppers rather than commercially purchased copper and that they were made as part of a large counterfeiting operation leading him to suspect the coins were produced in England. Also, the weight of the coins were similar to the weight of cast counterfeits mentioned in period treatises as having been cast around 1725 (Parrott, pp. 2-3 and Snelling, p. 44). Apparently the individual who had possession of these coins in colonial Philadelphia feared prosecution and buried them rather than passing them off. Exactly when this event occurred is unknown. Newman suspected it happened before 1741 when the exchange rate for halfpence became less favorable. These William III halfpence can be described as a hoard, that is, as a single group of coins collected together at one specific moment in time which then were either forgotten or became inaccessible. 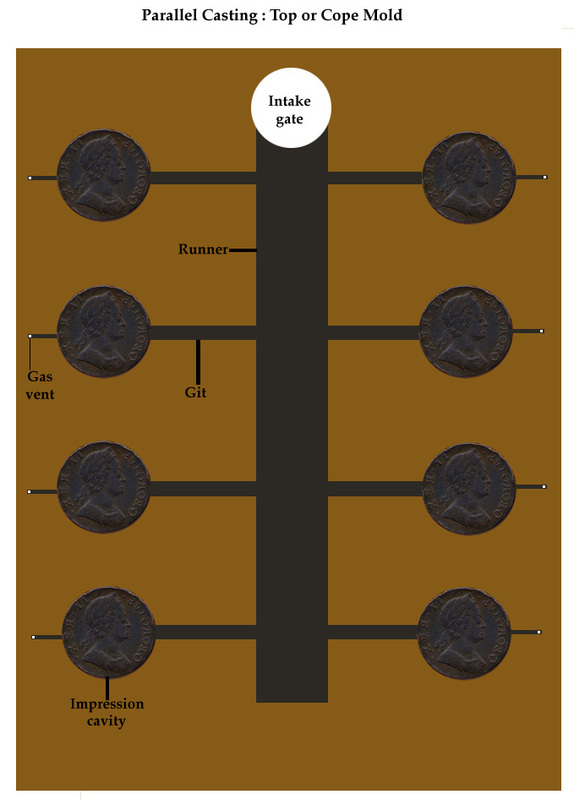 When hoards are discovered we can learn much about coinage in circulation at the time the hoard was assembled, if we can determine when that time was. The Philadelphia find was located because of road construction, so the area was quite disturbed; therefore we cannot be sure if other coins found in the vicinity of the William III counterfeit halfpence had been buried at the same time. Coins had been dropped in that area for almost three hundred years as coin were found with dates ranging from 1681 to 1907. Interestingly, there were four other cast counterfeit halfpence: a 1734 cast lead example, a 1737 cast pewter coin and two 1738 cast pewter halfpence as well as five struck counterfeits (three of George II and two of George III). Since the two 1738 cast pewter examples still have the overflow metal from the molds, it is quite likely, as Newman mentions, that they were locally produced experimental pieces. Possibly a counterfeiter from the 1730's dumped the William III halfpence and the other cast counterfeits at the site. Of course, if the lead and pewter counterfeit coins were backdated it would mean those coins would have been deposited in the ground (or lost) at a later date. As the section below will detail, even the cast William III coins could have come to the colony as late as the 1750's. For a full list of the Philadelphia highway find - Click here. Some Months past great Quantities of counterfeit Half-Pence were made at Birmingham ... but after its Discovery, the Government by seizing diverse large Parcels of them, and taking other proper Measures, sometime past entirely prevented their further Currency here: Whereupon, as I have lately understood, large Parcels of them were collected together in order to be sent to Boston, to be passed off in Payments there, part whereof according to my Intelligence was shipt in some of the last Ships and the rest are intended to be sent in some of the next.... [I] think it my Duty to send you this Intelligence, so this villanous [sic] Design may not take Effect in the Province. Indeed, The Boston Gazette of October 30, 1753 reported several bags of coins "in Imitation of the Copper English half Pence" had been seized from a passenger who had recently arrived from London. According to the November 2nd edition of the The Boston Weekly News-Letter the passenger was arrested but later made bail. Further information in the November 5th editions of both The New York Mercury and The New York Gazette stated the base metal halfpence were so light that six counterfeits weighed only as much as four regal issues (this would be about 101 grains each or about 70 per pound, whereas regal issues were about 152.2 grains or 46 per pound of copper). The situation was worse in New York where, as has been discussed in the section on regal coppers in the colonies, British coppers were trading at double their face value. A dispatch dated August 6, 1753 from New York City was published in the Boston Weekly News-Letter of August 16th stating that around the beginning of the month counterfeit halfpence had been seized in New York. Apparently a bag containing £6 worth of halfpence was discovered to have 36s worth of cast counterfeit coins. This calculates to 864 counterfeit halfpence or 30% out of a total of 2,880 coins. It was further stated the counterfeits were cast in sand with a rough look, indistinct letters and that they were two pounds underweight. As 36s in halfpence minted at the authorized weight of 46 per pound should have weighed 18.78 pounds, we can calculate these counterfeits were 16.78 pounds or about 136 grains each, which comes to just under 52 coins per pound. The article ends with the supposition these counterfeits were, "some of those that were so current in London some Time ago, and offer'd to Sale there for 7d per lb. [pound in weight]. They are of different Sorts and Dates." The Confusion in this City, occasioned by counterfeit Copper English Halfpence amongst us, is almost inconceivable; --- for notwithstanding the large Quantities of good Pence we have now long had, there is now hardly any Sum offered, but there are counterfeit Ones intermixed; and to such a Degree of Suspicion, is the common People raised, that many good Pence, which have passed current perhaps for about 20 Years past are now refused. On December 12, 1753 the New York Assembly passed an act against the importation or passing of counterfeit halfpence and farthings. They imposed a £100 fine for importing counterfeit coins while for knowingly passing counterfeit coppers one was fined ten times the amount of the coppers passed. Each year the court was to have the seized coppers melted down; the metal was to be sold with proceeds going to the relief of the poor. Local merchants had long realized the problem of the overvaluation of British coppers within the colony. By accepting them at double their face value large quantities had entered the colony. Importation restriction on coppers arriving from other colonies had been implemented earlier but now the threat came from counterfeits arriving from Britain. To curb the problem seventy-two New York City merchants signed an agreement on December 18, 1753 that they would receive and pay out halfpence at the rate of fourteen to the New York shilling rather than at the previous rate of twelve to the shilling. As this resulted in a devaluation of the money individuals then held, the situation led to a demonstration during which three instigators were arrested. To ease the situation the Mayor and Aldermen of New York took the following steps. In early January they consented to the revised rate of fourteen halfpence to the shilling (as reported in the Pennsylvania Gazette of January 22, 1754 based on a dispatch from New York dated January 14th). This clarified and standardized the exchange rate. Further they took steps to put the anti counterfeiting law of December 12th into action. On February 6 a brass founder named William Taylor was appointed to conduct the melting of all counterfeit coppers seized. Also, George Harrison, the Surveyor of Customs and Searcher for New York, went to work. On March 18th he seized a large quantity of counterfeit halfpence at a house in the city. An informant was paid and the counterfeits were sent to the Mayor. On April 8th the New York Gazette reported another seizure, this time 150 pounds in weight of counterfeits were seized in a store in the city and turned over to Alderman Filkin. Another of Harrison's seizure of between £30 and £40 in counterfeit halfpence was reported on May 16th. The first melting of counterfeits took place on August 7, 1754; the Mayor handed over 128 pounds in weight of counterfeits and Alderman Filkin turned in over 613 pounds in weight of such coins. Apparently the legalizing of the lower rate of fourteen halfpence to the shilling combined with effective and vigorous enforcement of the anti counterfeiting laws made the population feel the situation was under control so the panic and suspicion of coppers subsided. Nothing more was written on the topic in the newspapers after the summer of 1754. Last Night was seized on board the Prince of Wales, just arrived from London, a great Quantity of Copper Counterfeits; and 'tis said, that about Three Hundred Pounds Worth of them (had they been worth any Thing) were thrown overboard, to prevent Seizure. 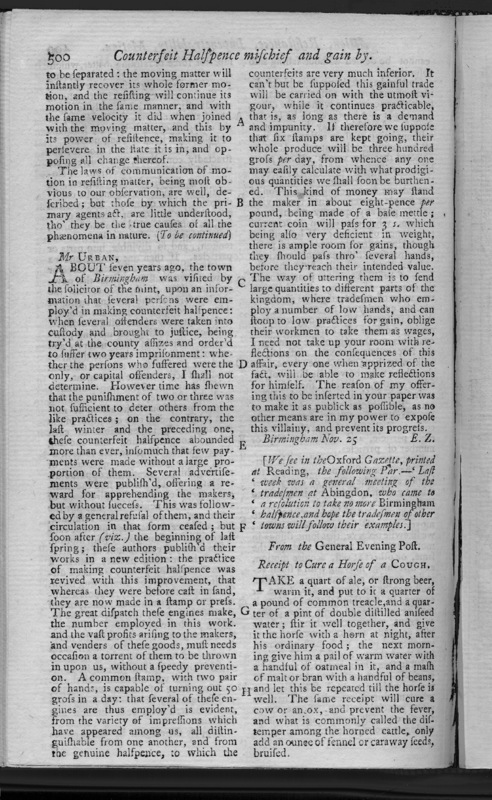 The Maryland Gazette of February 28, 1754 stated both genuine and counterfeit English halfpence were circulating in the colony and suggested the value of the counterfeits should be lowered to a farthing each (i.e. 48 per Maryland shilling as opposed to legal halfpence that circulated at 18 to the shilling and which this author suggested should circulate at an increased value of 15 to the shilling). The importation of counterfeits continued. In Massachusetts, the House of Representatives started an investigation of counterfeit coppers on March 27, 1755 stating, "as large quantities of counterfeit half pence, of base metal, had been imported, and, with French and other small copper coin continually increase, a committee are (sic) ordered to report measures to prevent such practices." It appears that by 1760 the majority of coppers sent over from Britain were counterfeits. In 1766 Rhode Island passed an anti-counterfeiting law that imposed death on counterfeiters, and unlike most earlier anti counterfeiting measures, this bill also imposed the death penalty on those who knowingly passed counterfeit coins. Although primarily directed at gold and silver the law also covered coppers. In the end, as in Britain, seizures and anti counterfeiting laws remedied this problem to the satisfaction of the general population. Also as in Britain, it seems the cast counterfeits were replaced with stamped counterfeits, which were soon estimated to comprise half of the halfpence in Britain. Clearly the importation of these stamped counterfeits was carried on apace and soon became the predominant coin in the colonies. Following the end of the war in 1783 British counterfeiters saw America as a prime market, especially since passing counterfeit coppers had been made a felony in Britain in 1771. Thus a flood of these counterfeits made their way to America. In fact, Newman has argued as early as 1785 or 1786 some varieties of counterfeit halfpence were produced in Britain solely for export to America. He has shown the five known varieties of 1785 counterfeit halfpence (from three obverse and three reverse dies) share the same letter punches (including what appears to be a specific broken R punch). Newman went on to assigned their manufacture to Britain because the same letter punches had been used to produce an obverse die for George III counterfeit Irish halfpence. Only one Irish coin made from that die has been discovered and that item has no date on the reverse but rather, the reverse contains a brockage, or inverse image, of the obverse! The evidence that these punches were used on an Irish counterfeit and the lack of any evidence connecting the punches to America led Newman to to suspect a British origin for coppers. Further Newman concluded the 1785 counterfeits were made solely for export because no examples of 1785 counterfeit halfpence have ever been discovered in English collections, rather all known examples have been found in worn condition in older American collections. Newman went on to suggest Massachusetts as a port of entry for the coppers. The Massachusetts Act of 1750 prohibiting importation of counterfeit coppers expired on November 1, 1785. No new law was enacted for eight months creating a "window of opportunity" for British counterfeiters. The copper coinage, current in our town, must be a considerable loss to the citizens at large, as the intrinsick value of most of the coppers in circulation, is not half what they pass for. Scarce a British vessel arrives in any port on the continent, but what it brings very great quantities of rap half-pences, and yet shameful as it certainly is, this inundation of base metal is passed with impunity and indifference. ...nearly one-half of the copper coin in this country for twenty or thirty years past has been of a base kind manufactured at Birmingham in England; however, it crept into circulation and did ... pass for the same value as those which are genuine. Thirdly. A very great number of pieces in imitation of British half pence, but much lighter, of inferior copper, and badly executed. -- These are generally called by the name Birmingham Coppers, as it is pretty well known that they are made there, and imported in casks, under the name of Hard Ware , or wrought copper. The report also mentioned New Jersey coppers circulated in New York, then went on to calculate the loss to the state from accepting these foreign coppers. One interesting fact related in this part of the report was that at that time British counterfeiters could purchase the highest quality red copper, pre-rolled into sheets ready to be cut into blank planchets, for eleven pence per pound. Using this (and lesser grade products) they would produce lightweight coins at an average of sixty copper halfpence per pound. Based on this report the New York legislature passed a law on April 20, 1787 regulating the circulation of coppers that stated, effective August 1, 1787 all regal weight coppers (i.e. 48 to the pound or about 152 grains each) would pass in New York at twenty to the New York shilling while all other lighter weight coppers, including the counterfeits, would be deemed illegal and "shall be liable to be seized" and handed over to a Justice of the Peace. The pervasiveness of counterfeit British coppers is also borne out by the archeological evidence. The John Bridges Tavern, located just northwest of Ft. Ligonier in western Pennsylvania, was in operation ca. 1775-1795. In the excavation of that site 25 copper coins and four unidentifiable copper disks were unearthed along with 9 pieces of Spanish silver. Fourteen of the sixteen halfpence were counterfeit (there were 11 counterfeit George III halfpence of which two were American made, 3 counterfeit George II halfpence, 1 regal George III halpenny and 1 regal George II halfpenny). The other coins unearthed included: 1 regal George II farthing, 1 cut regal George III halpence (only 1/4 of the coin), 1 New Jersey copper, 1 Virginia halfpenny, 1 Constellatio Nova copper of 1785, 2 Connecticut coppers, 2 French coppers, the 4 completely worn copper disks (which Trudgen suspects were halfpence), 7 Spanish half real coins and 2 cut two reales coins (one was 1/4 thus equaling a half real and the other was 1/8 of the coin thus equaling a quarter real). In all there were 16 halfpence, 9 other coppers and 9 pieces of Spanish silver. Of the 25 coppers 64% were British halfpence and out of those only two or 8% were regal and another two or 8% were American counterfeits, thus 48% of all the identifiable coppers found at the site were counterfeit British halpence. As this find represents coins lost over a defined twenty year period of time it can provide important evidence concerning general trends in the circulation of colonial coinage but clearly it is not as revealing as a hoard buried at a specific moment in time. Also, we can assume individuals searched longer and harder for more valuable change that might have fallen from their purse or pocket, thus the remaining evidence would show a higher number of the "cheap" or less valuable coins not worth troubling oneself to search for. Nevertheless the proportion of British counterfeit coppers clearly shows they were a significant part of the local economy. Recently, John Kleeberg has shown the ship known as The Faithful Steward, which left Londonderry in Northern Ireland on July 9, 1785, was carrying a large quantity of illegal counterfeit British halfpence to America along with some 249 passengers when it sank off the coast of Maryland. This is one of many examples of a legitimate operation carrying illegal coppers in order to make extra profits. Kleeberg has also suggested, based on this example and other hoards of counterfeits found in Ireland (as the 206 counterfeit halfpence found near Jonesborough, County Armagh, now in the Ulster Museum), that some British and Irish counterfeit halfpence imported to America may have been made in Ireland rather than England. Along with counterfeits there were several "evasion issues" produced in England and Ireland. These issues did not try to make exact copies of coppers (usually halfpence), instead they only tried to closely resemble regular issues. Usually the images would be the same but the motto "Georgius III Rex" would be changed to "George Rules", "Georgius III Pax", "Britain Rules" or the like. Sometimes the portrait of the king would face in the wrong direction. Since these coins were not exact copies of regal issues, the makers could not be charged with counterfeiting under English law. Some individuals turned to evasion pieces as early as the 1750's but the majority were produced after counterfeiting coppers was made a felony in 1771. Newman (pp. 151-153) has traced the history of evasion coins and found they were not used in America. The idea that evasion coppers were used in America was first posited by the German coin dealer S.K. Hazfeld who came to Philadelphia in 1877 and introduced evasion coppers to the American numismatic community. The New Jersey specialist Edward Maris believed evasion coins were indirectly referred to the July 14, 1781 document signed by John Reed, the president of the Supreme Executive Council of Pennsylvania that is quoted above, which stated "Divers ill-disposed persons have manufactured or imported into this State quantities of base metal, in the similitude of British half-pence". Maris felt similitude referred to evasion rather than counterfeit coppers. Clearly this is a distinction Maris could easily make, but his error was in supposing it was a distinction John Reed understood and was trying to make. Rather it seems Reed simply used this term to refer to counterfeit coppers as similar to the regal coins. Most later coin dealers followed Hazfeld and Maris in describing evasion pieces as having been used in America. Newman has explained no evasion copper has ever been found in excavations at an American site nor has one appeared in a colonial coin hoard. Recently, Philip Mossman has concurred in this opinion stating: "there is no evidence that evasive halfpence ever circulated in America nor is there any report of such pieces being recovered in accumulations or hoards from the colonial period." (Money of the American Colonies p. 123). In fact, it would seem reasonable that counterfeiters, under fear of prosecution, would want to send their products out of the country, while there was no such incentive for the export of evasion issues. However, while vast numbers of counterfeit halfpence were being shipped to America, it does seem a small number of evasion coppers also made their way to the colonies. On April 4, 2019 John Goff, a metal detectorist in Vermont, e-mailed and sent me images of a well-worn George II evasion Irish copper dated 1756 with the legend George Ruled that he had uncovered. The find was made on April 3, 2019 in the township of Ferrisburg, VT. A very well preserved specimen of this same variety is illustrated on our website. For those interested in viewing a few evasion coppers - click here. The Gentleman's Magazine, ed. by Sylvanus Urban, London: E Cave, vol. 22 (November 1752) p. 500 contains a letter from E.Z. of Birmingham dated November 25, titled, "Counterfeit Halfpence mischeif and gain by." followed by an excerpt from the Oxford Gazette about Abington tradesmen resolving to take no more Birmingham halfpence. Click here for a jpeg image of the full page. And here to view larger versions of column one and column two. Counterfeit, or more properly, imitation, British coppers made in the colonies, at Machin Mills and other locations, are listed separately. The examples below are considered to be of English origin, although as Weston has recently discussed, attribution to America or Britian is usually subjective. He suggests using the term "Anonymous Halfpence" rather than British or American. Diagrams of a serial casting mold. Top Mold and Bottom Mold. Diagrams of a parallel casting mold. Top Mold. See: C. Wilson Peck, English Copper, Tin and Bronze Coins in the British Museum 1558-1958, second edition, London: British Museum, 1964; Eric Newman, "American Circulation of English and Bungtown Halfpence", Studies on Money in Early America, edited by Eric Newman and Richard Doty, New York: American Numismatic Society, 1976, pp. 134-172; Mossman, pp. 108-123; Kenneth Scott, Counterfeiting in Colonial New York, Numismatic Notes and Monographs, no. 127, New York: American Numismatic Society, 1953, especially pp. 102-109; William Anton and Bruce Kesse, The Forgotten Coins of the North American Colonies, Iola, Wis.: Krause, 1992 and Byron Weston, "Evasion Hybrids: A Commentary on Counterfeit Halfpence and Farthings," The Colonial Newsletter 34 (November 1994, serial no. 98) 1465-68 with comments by J. C. Spilman following the article on the final page. On the tavern excavation see Gary A. Trudgen, "Early American Coins Recovered from the John Bridges' Tavern Site,"The Colonial Newsletter 35 (July 1995, serial no. 100) 1534-40; and on the Philadelphia find, Eric P. Newman and Peter P. Gaspar, "The Philadelphia Highway Coin Find," The Numismatist vol. 91 (March, 1978) 453-467; Richard Parrott, Some Cautions Concerning the Copper Coin, London: for R. Baldwin, 1751; Thomas Snelling, A View of the Copper and Coinage of England, London, 1766; Eric Newman, "Were Counterfeit British Style Halfpence Dated 1785 Made Specifically for American use?" The American Numismatic Society, Museum Notes vol. 33 (1988) 205-223 and plates 24-25 with a classification of struck counterfeit halfpence dated 1781 and 1785; John M. Kleeberg, "The Shipwreck of the Faithful Steward: A"Missing Link" in the Export of British and Irish Halfpence," in Coinage of the Confederation Period, ed. by Philip L. Mossman, Coinage of the Americas Conference, Proceedings No. 11, held at the American Numismatic Society, October 28, 1995, New York: American Numismatic Society, 1996, pp. 55-77; Charles W. Smith, "The English George III Contemporary Counterfeit Halfpenny Series: A Statistical Study of Production and Distribution," in Coinage of the Confederation Period, ed. by Philip L. Mossman, Coinage of the Americas Conference, Proceedings No. 11, held at the American Numismatic Society, October 28, 1995, New York: American Numismatic Society, 1996, pp. 23-53; Charles W. Smith's, "The Annotated Halfpenny," The Colonial Newsletter 37 (August 1997, serial no. 105) 1715-1726 reproducing and annotating an 18th century story of the circulation of a counterfeit halfpenny; also, Charles W. Smith and Philip L. Mossman, "Cast Counterfeit Coppers in Pre-Federal America," The Colonial Newsletter 38, no. 1 (April 1998, serial no. 107) 1775-1803 (includes information on cast British halfpence made in Britain as well as casts of confederation era coppers made in America. In America cast counterfeits continued to be made throughout the century.) and also of general interest see: John Craig, The Mint: A History of the London Mint from AD 287 to 1948 Cambridge: Cambridge University Press, 174-176, 182 and 250-254; and C.E. Challis, ed. A New History of the Royal Mint, Cambridge: Cambridge University Press, 1992, pp. 365-378 and 434-438. For viewing tips and information on optimal computer settings click here. For our copyright statement click here.